CarGurus has 535 nationwide S3 listings starting at $16,995. Right from the get-go, it’s obvious that Audi’s debuting 2015 S3 sedan is a sport-packing alternative to that run-of-the-mill, but nonetheless quasi-posh A3. Sure, the new S3 looks very similar to its A3 cousin, and yeah, it seats 5, carries about the same trunk space (some 13 cubic feet) and packs a turbocharged inline 4-cylinder (I4) powerplant, but don’t be fooled—the S3 totes a few performance features that should have it running in circles around its lesser line-mate. But let’s start with the basics: The new S3 comes in 2 trims, the entry-level 2.0T Premium Plus Quattro and the up-featured 2.0T Prestige Quattro, with the Quattro designation an indicator that both trims are delivered with standard all-wheel drive (AWD). The 2015 S3 also sports a 4-mode drive-select system to suit the commute to your mood, while a performance suspension means you’ll go out of your way to find some S-curves that you can turn into I-ways. The standard, indeed the only powerplant endowing the brand new S3 is the same transverse-mounted 2.0-liter turbocharged gasoline-burning I4 that’s available to its A3 brethren. 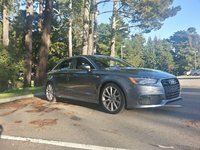 Although this pint-size Audi has been touring Europe since the late '90s in hatchback garb, it comes only in sedan form here in the U.S., and only with the capable though kind of namby-pamby 6-speed auto-manual transmission. Reviewers here and abroad, meantime, wonder occasionally when a stick-shift version will arrive. But no matter. Unlike its A3 kinfolk, the S3’s force-fed 4-banger has been tweaked to put out 290 hp and 280 lb-ft of torque, a far cry from the A3’s more plebian 220 hp and 258 lb-ft of torque out of that same mill. Meantime, Audi claims mileage figures of 23 mpg city/31 highway using recommended premium gas in this beefed-up-4. Oh, and at least one track test had the S3 going from 0-60 in an eye-opening 4.4 seconds. Appearance bling and creature comforts, you ask? Look for 18-inch painted alloy wheels, a rear spoiler, heated power-adjustable mirrors and a power sunroof to be delivered in both S3 iterations, along with leather upholstery, heated and power-adjustable sport front seats and full power accessories. Of course, cruise control is standard for both trims, as are telescoping tilt-wheel steering, dual-zone climate control, steering-wheel-mounted paddle shifters and Bluetooth-integrated Audi connect directions and connections technology. The 2015 S3 Premium Plus trim sports a 180-watt stereo with a single-CD player, 10 speakers, satellite radio and a memory-card slot, while the Prestige trumps that with a 705-watt Bang & Olufsen premium system toting 14 speakers and an extra music-card slot. And both systems, as well as the Prestige trim’s standard GPS navigation system, operate under the management of Audi’s touted MMI infotainment function. Speaking of the upper-crust Prestige, along with the improved audio system this flagship trim also offers a standard rear-view camera, an auto-dimming rear-view mirror and LED headlights and taillights. Despite all the plush carried as standard equipment, options are nonetheless available and include 19-inch wheels and performance tires, rear side-mounted airbags and an Advanced Technology Package, sporting adaptive cruise control with pre-collision braking, lane-keeping assistance and a camera distance sensor to ease parking chores. Finally, standard safety features in the 2015 S3 include 4-wheel antilock brakes (ABS), traction and stability control, front side-mounted airbags, and front and rear head airbags. The standard turn-signal-integrated mirrors, meantime, are complemented by LED daytime running lights, high-intensity-discharge (HID) headlights and a post-collision safety system, with security enhanced by the delivered remote antitheft alarm. 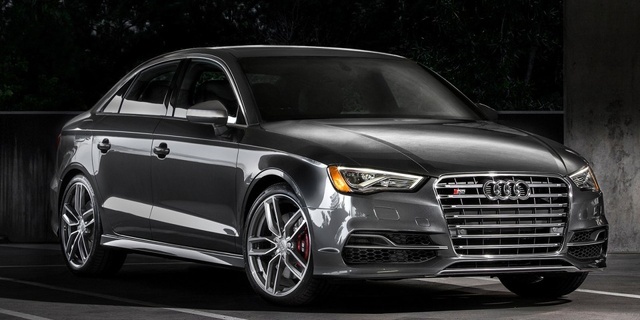 What's your take on the 2015 Audi S3? 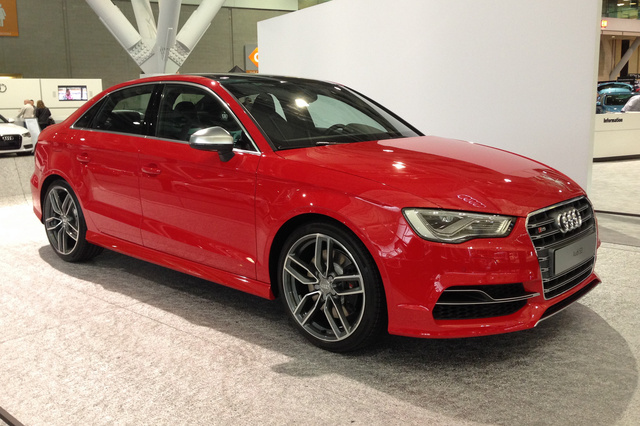 Have you driven a 2015 Audi S3?